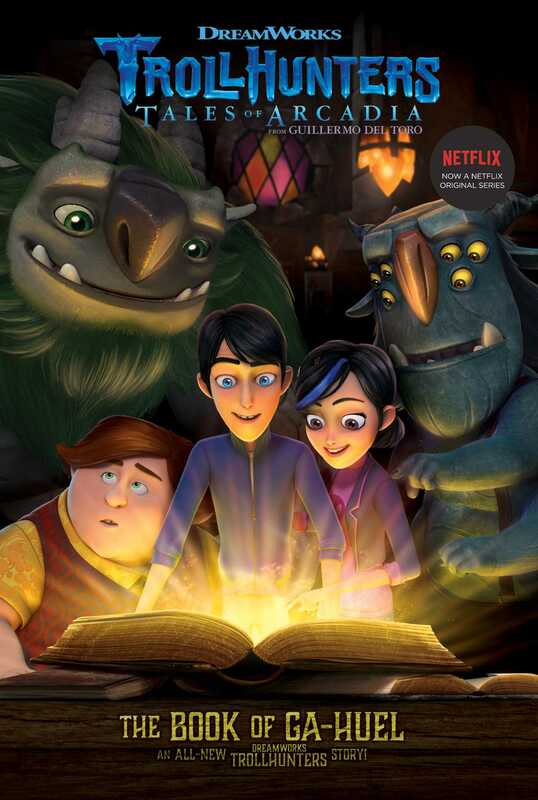 This all-new epic story based on the hit Netflix series Trollhunters—from the limitless imagination of acclaimed filmmaker Guillermo del Toro and DreamWorks Animation—delves into the hidden world of Trolls and uncovers a mystery that has haunted Trollhunters for centuries! For centuries, Changlings have recorded the history of Trolls and Gumm-Gumms in The Book of Ga-Huel. This ancient tome is, literally, a living document with new entries mysteriously appearing—or disappearing—in it. When Trollhunter, Jim Lake, Jr., gains possession of the book, he and his friends are fascinated by what they discover. But when a new passage appears and it points to the death of a beloved friend, the team must race against time to uncover the invisible force predicting a future no one is willing to face. Music thumped through the speakers. Carnival lights lit up Jim’s backyard. A WELCOME HOME, JIMBO! banner unfurled. And Jim’s best friends—Toby, Claire, Blinky, and AAARRRGGHH!! !—group-hugged their returned Trollhunter. Well, except for NotEnrique. The little Changeling wasn’t too big on public displays of affection. “Glad to have you back,” AAARRRGGHH!!! grumbled, tousling Jim’s hair. “You too, big guy,” said Jim. He hugged the giant Troll, happy to hear a heartbeat under all that muscle and fur. Jim reminded himself that it wasn’t long ago that a poisoned blade had solidified AAARRRGGHH!!! into a lifeless statue, only for the spirits of past Trollhunters to revive him. “We would’ve had this shindig a little earlier, if it wasn’t for this week’s Goblin trouble,” Toby said, flashing a braces-filled grin. “Eh, human food’s overrated,” said NotEnrique, scarfing down an old gym sock. “Speaking of snacks, it’s time to unlock the guac!” Claire announced. She held out a bowl of her famous guacamole for the group. Jim dipped in a tortilla chip, took a bite, and closed his eyes. He chewed in silence, and Claire tried to read his reaction. In truth, everything did seem perfect to Jim—especially when compared to what he endured in the Darklands. For two weeks Jim fought for his life in the dismal dimension. The only foods he had eaten there were raw Nyarlagroth eggs. The only banners he had seen were the war flags carried by two clashing armies. The only weather he had experienced was the mercilessly cold wind whipping against his Eclipse Armor. And the only company he had kept was the chalk drawing Jim made of his friends—that, and a talking fireball who betrayed Jim shortly before trying to kill him. Overall, it had been a pretty weird time for the Trollhunter. NotEnrique popped a vinyl record onto the turntable and cranked up the volume. A blistering Papa Skull track flooded the yard, and Team Trollhunters started dancing. Claire giggled at Jim’s patented “thumbs-up groove.” Blinky popped and locked with all four of his arms. And Toby cheered on AAARRRGGHH!! !, who had picked up a lot of moves from their Go-Go Dance Uprising video game. “Go Wingman! Go Wingman! It’s your birthday!” said Toby. “What is the meaning of this? !” yelled someone from across the yard. The record needle scratched, and everybody stopped dancing. At first Jim thought they must’ve been found out by a neighbor with a noise complaint. How was Jim going to explain to his mom that he was throwing a house party while she worked a night shift at the hospital? Or that he was secretly living a double life as an armored, magically powered champion? Or that Jim had already erased the truth about his Trollhunting from her memory once before? But before Jim could come up with a lame excuse, the party crasher stepped closer. The twinkling carnival lights revealed a blue, broad, and spiked Troll. “How can you possibly have a party . . . without these?” said Draal, pulling his mechanical arm from behind his back to reveal three plump watermelons. The Amulet floated before Jim and released swarming orbs of pale blue energy. Interlocking metal plates manifested out of the thin air and contracted around Jim’s body, sheathing him in radiant armor. The Trollhunter gestured, and the Sword of Daylight appeared in his awaiting hand. Draal hurled all three of the melons. In one fluid stroke, Jim slashed through each of them, splattering the rest of Team Trollhunters with melon chunks. They looked at one another in startled silence—then burst into applause. “Now that’s how you party,” said Draal. “Hey, Draal, any more where those came from?” asked Toby, pulling a small hammer from his back pocket. The spiked Troll winked before rolling over to the garden bed, where Jim grew organic fruits, vegetables, and herbs to be used in his cooking. Draal peered between shrubs of thyme and rosemary, finding a fourth, much larger watermelon. He cocked a metal thumbs up to the group, and Toby extended his Warhammer to its full, formidable size. Knowing what was coming next, Jim, Claire, Blinky, and AAARRRGGHH!!! hid behind one of the boulders in the backyard and giggled. Much later that night—after his guests had picked the last melon seeds from their hair and fur, and left—Jim went to sleep with a smile still on his face. But when he heard a strange sound and opened his eyes, Jim discovered he wasn’t in his bedroom anymore. He was back in the Darklands. In place of pajamas, Jim now wore the black-and-red Eclipse Armor. Frigid gales whipped his exposed hair, and a photonegative sun shone sickly green light upon the jagged terrain. Overcome with dread, Jim took a step backward, only for the ground to crumble beneath his feet. Jim cried out as he plunged through darkness. He thought he might die this way, falling forever, until the Trollhunter’s open hand caught something. It was a chain. The abrupt stop made Jim’s shoulder pop out of its socket, but he still managed to hold on to the rusted metal links. Mustering all his strength, Jim pulled himself up the chain. Even the slightest movement sent an agonizing throb running down his arm, but he refused to let go. Blinking away tears, Jim’s eyes refocused and saw that he was now clinging on to a bassinet. “The Changeling nursery!” he gasped. Jim then heard a baby start to cry. The wail came from everywhere and nowhere at once. His armored hand reached into the bassinet, peeling back the blankets. But the more Jim pulled on the fabric, the more folds it seemed to reveal. The bleating cries grew louder, drowning out the sound of the Jim’s pounding heartbeat. He finally tore off the last blanket. And the very sight of the horror he unveiled made the Trollhunter scream. Jim’s eyes snapped open. He was back in his room, drenched in sweat, jaws clenched. His arm had gone numb, not from a dislocated shoulder, but from sleeping awkwardly on it.